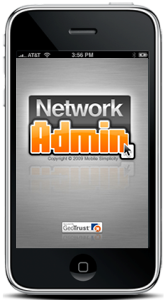 Network Admin is an application developed for IT Companies and Network Administrators. Network Admin allows you to keep an up-to-date, secure and compact repository of your clients’ network configurations with you at all times. No more need to carry around that binder full of spreadsheets or turn on your laptop while on-site to get your customers network details. Network Admin also allows you to share your company profiles in real-time with your managers and technicians with secure 128bit AES encryption using a private key. Different permission levels allow you to control who sees what information and who has read only and read/write access to your profiles. All of your information is decrypted on-the-fly directly on your device using your private key. Encrypt keys are NOT retained on our server, so make sure you save them in a safe place! Access to the program is also restricted by utilizing a 4 digit PIN number which you create upon launching the program for the first time.